Hey good people and happy Thursday! 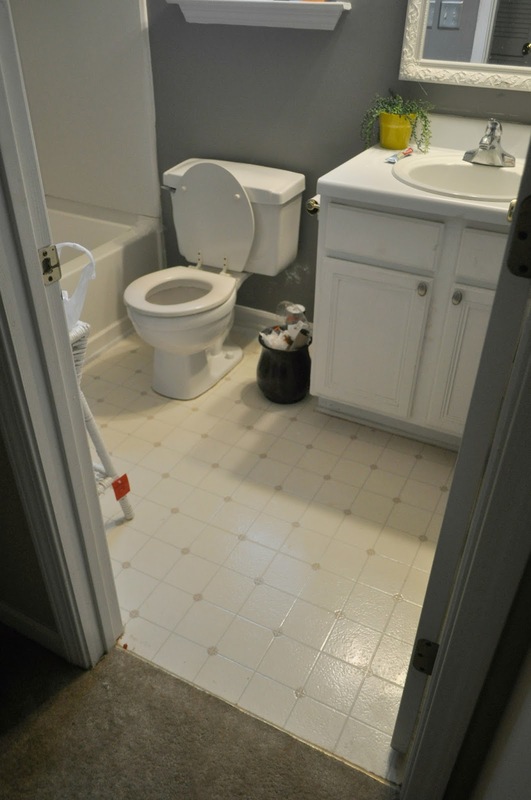 Well I’ve good two major things crossed off of the list this week in regard to the guest bathroom makeover. Woo Hoo! 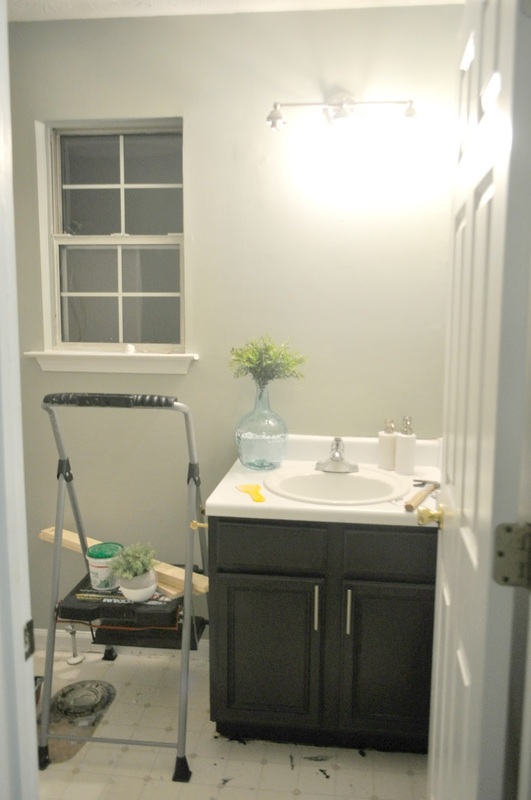 The wall color has been updated, and the vanity is a whole lot more modern! This post is rather informal, so I shot things pretty much as they were at the time. I’m committed to showing more of real life and progress during a project, and not just the pretty after. 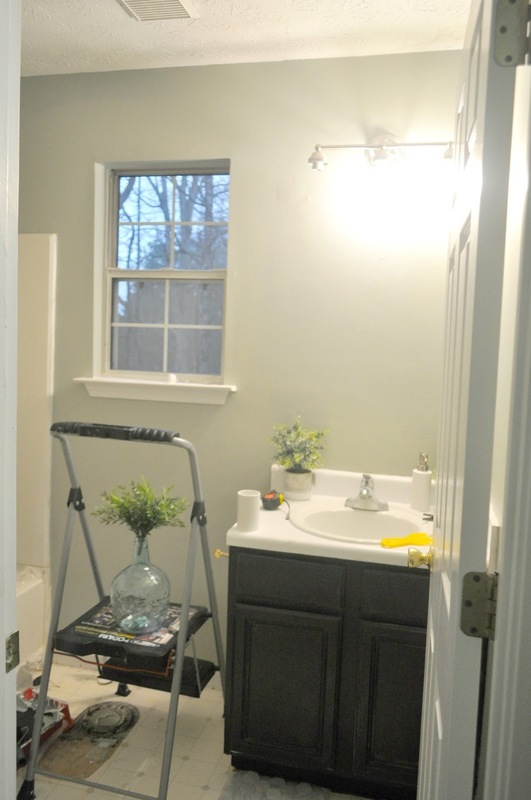 You may remember from reading my official guest bathroom plans, I mentioned painting the bathroom wall Sea Haze by Benjamin Moore and giving the vanity a dark makeover. Well, thus far I don’t regret either of those decisions. I’m sure you remember the before of the all white vanity…. Here it is after the first coat of paint. I painted it Totally Black by the Home Decorators Collection in at Home Depot in a Satin Finish. My favorite way to get a pro finish when painting something with a bunch of crevices is by using a decent quality foam brush like this one. In the areas that the foam brush doesn’t reach, I like to use a regular paint brush. My favorite brand is Purdy. And here it is after a couple of coats and the added new hardware. 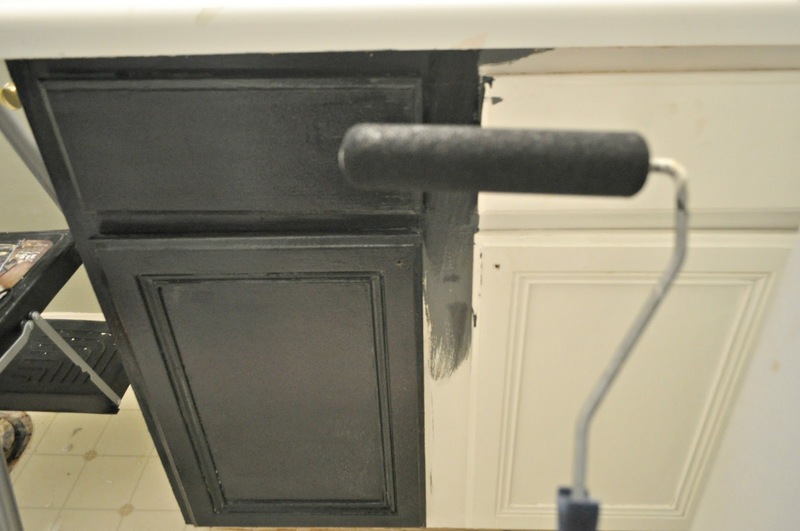 These are the old pulls from my kitchen makeover. Sorry for the grainy night shots. I told you I am shooting as the updates are happening so these are truly behind the scenes shots. Here is the room once I added the trim, which still needs to be caulked and painted. What a difference paint has made so far! Well, that’s all I got for you all today. Between balancing work, soaking up family time on the weekend and just managing life, I am squeezing in work on the bathroom after putting my son to bed. But after each update I smile and know its worth it. I cannot wait to put the floors down! 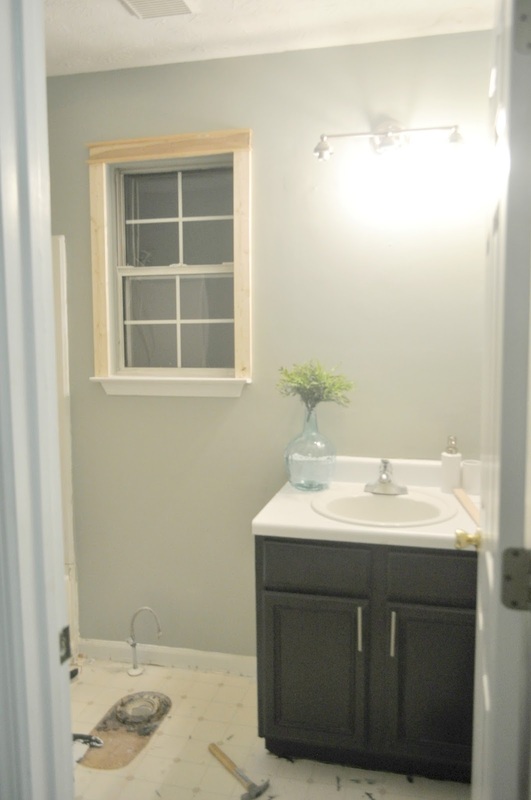 This weekend I am hoping to tackle window trim, backer board, and maybe even start laying the tile! Wish me luck. I think I’ve found the perfect shower curtain, mirror and a few styling accessories as well. Thanks for following along. I’ll be back next week with an update. Have a great weekend. 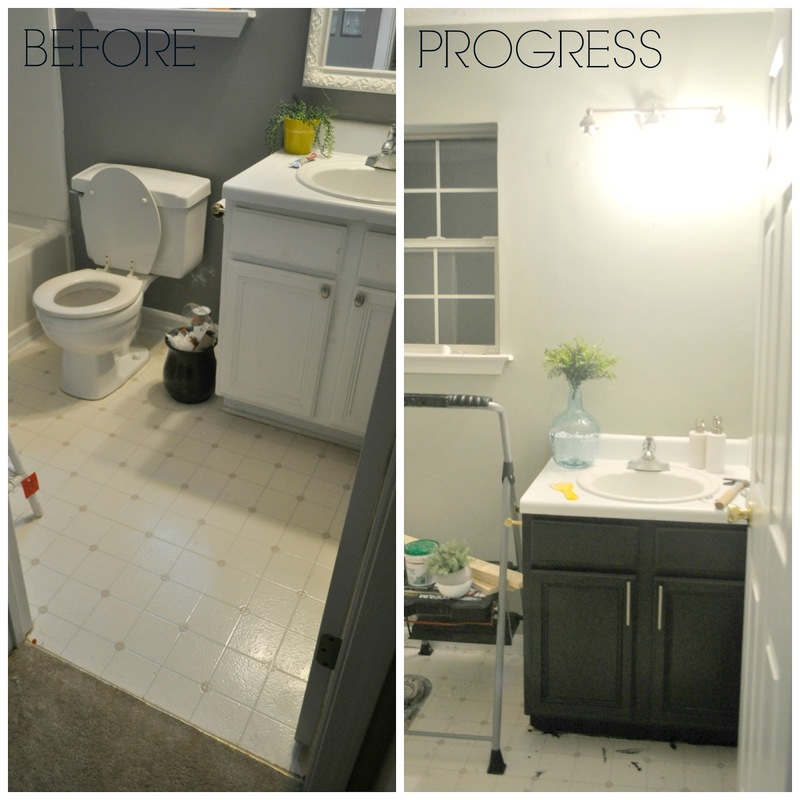 I love seeing in progress of pictures of projects, the vanity refresh already looks so much better! Can't wait to see everything all finished together! The black vanity looks awesome! This is going to be Fantastic! I can't wait to see the that floor installed! The cabinet looks amazing also. Erin everything is coming along nicely! I love the new vanity and wall color, looks great! Thank you Darnetha. I am loving the changes so far! Your reno is looking good. 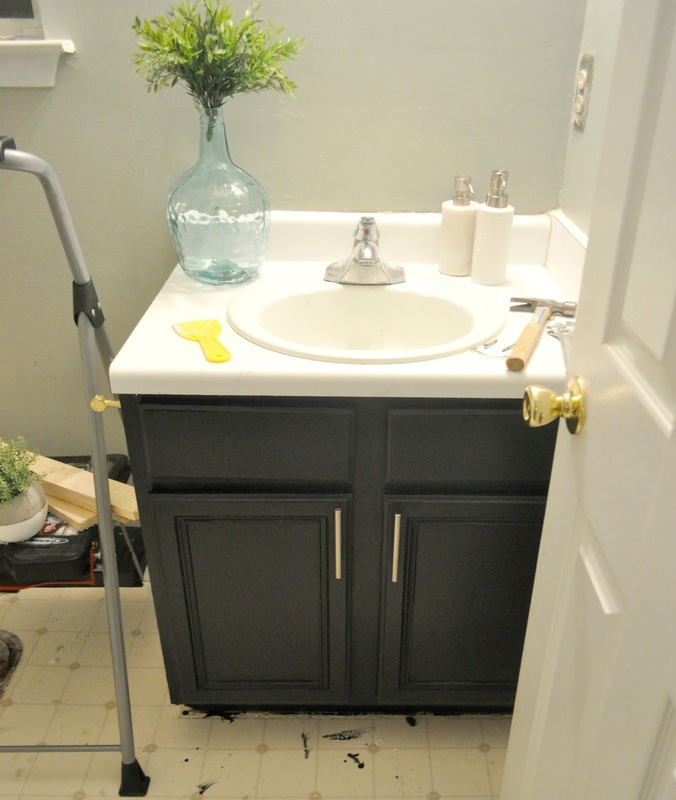 That paint cabinet color looks great with your flooring choice. I also think the casing around the window transforms that as well. It's looking so good, Erin! 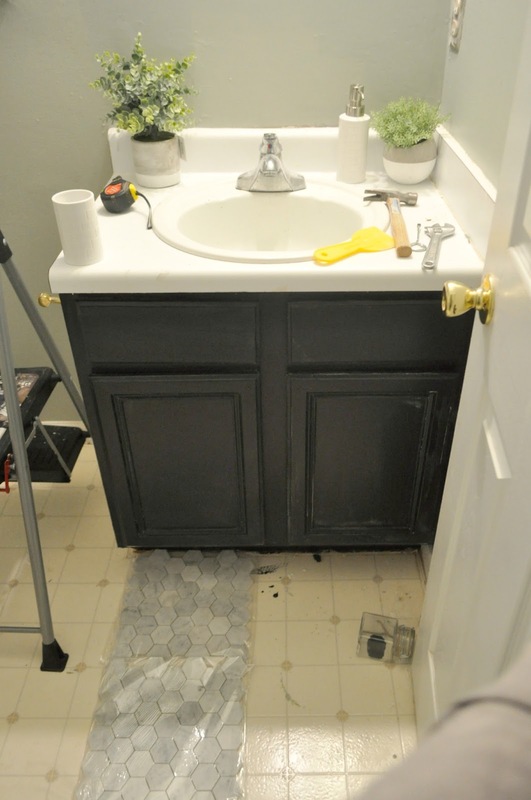 I love the wall color and you know I love a black vanity! I can't wait to see the floors down, that tile is so pretty.